Cerodontha (Dizygomyza) luzulae (Groschke, 1957); Bland, 1993. Entomologist's Gaz. 44: 271-3. 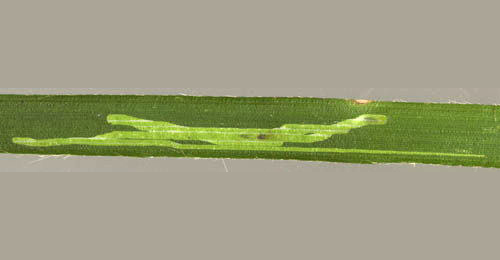 Leaf-mine: Larva forming irregular linear mine (Spencer, 1990: 345). Rather narrow corridor, upper-surface or interparenchymatous, 12-20 cm in length, about 2 mm wide. Mines yellow, contrasting against the dark green leaves, but sometimes they are deep purple. The corridor changes direction at least twice. Generally it does not leave the blade. Frass in one or two large lumps. Pupation inside the mine (Bladmineerders van Europa). The larva is described by Nowakowski (1973) and in Bladmineerders van Europa. Time of year - mines: Larvae in August-October; larvae in the Netherlands in November (Bladmineerders van Europa). Distribution in Great Britain and Ireland: Bland discovered this miner in the UK (Bland (1993a);Entomologist's Gazette 44: 271-273) and found it to be widespread in Southern Scotland - recording it from 11 vice counties (British leafminers). Distribution elsewhere: Widespread in continental Europe including Poland and southern Germany, common in mountain forests (Spencer, 1990: 345), The Netherlands (Bladmineerders van Europa) and Hungary (Martinez in Fauna Europaea).